The Theory of Everything documents Hawking's (Eddie Redmayne) time at Cambridge University in the 1960s, where he excels at Physics in spite of his relatively lax attitude. As time goes, Hawking's life encounters all manner of twists and turns, including his relationship with future wife Jane Wilde (Felicity Jones), and his eventual diagnosis with motor neuron disease which gradually deteriorates his physical state - something he refuses to let destroy his ambitions, but one he cannot fight to overcome. This story is not just an interesting retrospect on Hawking's life, but a rich and charming love story which is fueled by some fantastic direction and excellent performances from Redmayne and Jones. Redmanye faces a tricky role as he slowly develops from a young and perfectly healthy Hawking to his modern paralyzed state, and he carries this challenge effortlessly. It's most certainly one of the film's greatest attributes, and Redmayne's acting conveys all manner of Hawking's important emotions: his witty sense of humour, his sheer intelligence, and his emotional turmoil as his illness progressively takes its toll. It does seem a bit confused as it nears it's second act, featuring a poorly developed character played by Charlie Cox - whom of course is a real figure in Hawking's life, but a relatively unlikeable one in this film's narrative. 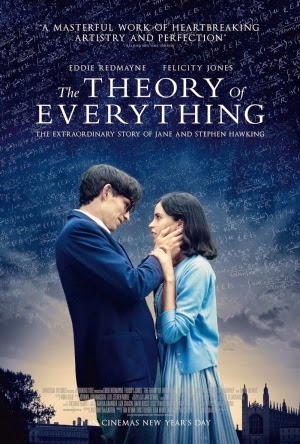 Things can drag out, but for the most part, The Theory of Everything is saved by a superb lineup of performances and an interesting in depth look into Hawking's various theories and ideas. The script and Redmayne's performance masterfully replicate Hawking's character, and it's nicely combined with a charming romantic narrative, resulting in a sweet and touching film that succeeds as an engrossing dramatized biography.